Tjip, Suzanne, Pieterjan and Pepijn. In daily life they work as consultants and coaches at Kessels & Smit, but they are also Deejay’s. As a team, they create professional radio shows about innovation and learning. 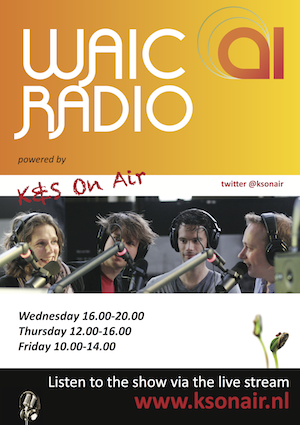 And for the WAIC they will host a special edition: WAIC Radio. Why radio? Because radio is fun to make, it is fun to listen to and it forces you to get to the essence, to be brief. And… people can join in and participate in the making of a radio show. So as a listener, you have influence on the shape and content of the story. It spices up and connects any group or community. The aim behind WAIC radio is to increase WAIC’s impact by involving a larger group of people: people who can’t join the conference in person, can listen to the show. And they can participate: by requesting special songs, by doing phone interviews, by saying ‘hi’ to friends… So it is a way to connect the inside world of the conference to the outside world and vice versa. But WAIC radio will also contribute to connecting all of the on-site participants. With radio, you combine the intimacy of a personal conversation, with the impact of large scale. We can interview someone and have a very personal conversation, and all the others can listen. That is a special experience. And as a participant, you can also phone in and share a message or thought with the rest of the people out there. It will contribute to the feeling of being a community. A different show will air on each day of the conference. It will be exciting and varied: back stage interviews with keynote speakers, interview with participants, favorite music from participants and listeners, games, battles and the latest WAIC-gossips. If you want to participate, for instance by suggesting an opening song, you can in several ways, see the box for all contact data.